And’ the interpretation of the young man in the Valpolicella, a wine suitable for every occasion, designed for young people knowledge of the world enoic acid. The Sommelier: the Blend of the grapes Corvina, Corvinon, Rondinella, Oseleta and Molinara is an excellent wine with a ruby red colour of good intensity with violet hues. 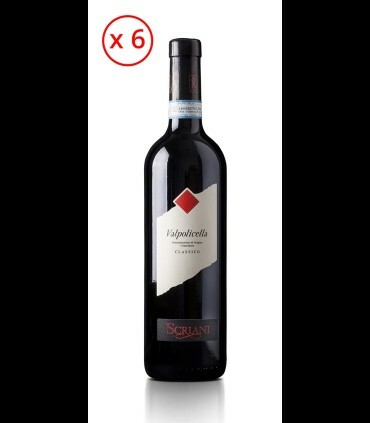 The nose reveals notes of ripe cherry, morello cherry and plums, slightly dried; In the mouth, soft and enveloping, with a pleasant flavor and notes of ripe fruit and spices, good persistence. Food pairings: A great food wine , very versatile, a lover of soup, vegetables, soups, and vegetable soups, tripe soup, to the eggplant parmigiana, and dishes with olive oil, boiled meat in general, medium-ripe cheeses, the traditional bagna càuda. Uncork and decant one hour before serving at temperature 18 - 20 °C. in the chalice, the Grand Ballon.